Creative Living is the conscious cultivation of improved health, happiness, fulfillment, and inner peace in your life. Based on my own journey and work with clients around the world, I have distilled 7 keys to what I call Creative Living. By integrating the 7 keys and their associated proven practices and powerful strategies into your life, you will learn to thrive in life and in business/work. In other words, you will learn to dance with life. Find inner peace, and build peace in your family, friends, community, workplace… the world. A chapter is devoted to each one of the 7 keys in my book Learning to Dance with Life: A Guide for High Achieving Women. The value of growing your practice of the seven keys is supported by evidence from neuroscience, the arts, and Eastern psychology. 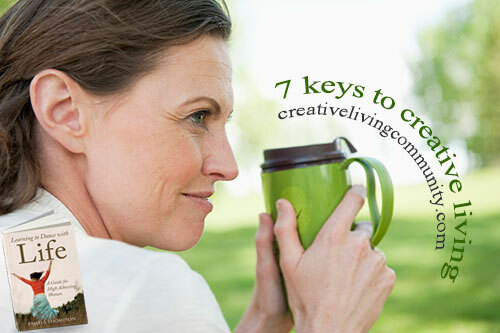 I’ve learned from personal experience and from working with clients that integrating the seven keys to Creative Living into your life will support you as you learn to dance with life. Are you interested in learning to dance with life or are you currently dancing with life? I’d love to hear your comments. Feel free to post them below and to share this with others. Lovely, beautiful wisdom. Thank you for sharing. Now to naked sure I continue to implement the inner stillness within. Thanks for your kind words of support. Happy you found the post useful. I am excited about my upcoming launch! Thanks for taking the time to share your thoughts. Happy you find the blog of interest. I just want to say I am all new to weblog and honestly enjoyed this blog. Very likely I’m going to bookmark your site . You absolutely come with wonderful article content. Appreciate it for sharing with us your blog. Thanks for the positive feedback. If you would like to receive my blog on a regular basis you may sign up for the Transition Journey Quiz and you will also receive each new blog I write. It is truly a nice and useful piece of information. I am glad that you shared this helpful info with us. Please keep us informed like this. Thank you for sharing. Hello, Thanks for your positive feedback. I’m happy that you found the post useful.